This Lounge in Cyber Hub Serves Crazy Cocktails & Delish Food! Your favourite pub, Pier 38 has added brand new dishes to their Lebanese, Arabic and Indian menu & it’s unmissable. Foodies, time to reconsider your next fancy meal location! If you have been wanting to check out Pier 38 for its cool decor and crazy concoctions, we’re giving you another reason to do it. They’ve introduced some new Lebanese and Arabic delicacies to their menu that’ll complement your drinks and cocktails beautifully. For starters, you can munch on Turkish Pides (also known as Turkish pizza) which is oval-shaped, and loaded with veggies and meat. If you have always been a shawarma lover, you’ve got to add their Black Chicken Shawarma to your list (that basically looks like a mini shawarma machine). Do try their lamb shawarma with hummus, it’s so flavourful and the hummus just steals the show. This place is not only a haven for non-vegetarians, but is also a paradise for veggie lovers. The corn and cheese balls and Arabic cottage cheese skewers are to absolutely to die for. The newly-added Moussaka is an Arabic specialty that is prepared by layering veggies, cheese and baked red beans. You can also gorge upon Mahiche, where lamb is cooked in Arabic curry, and works perfectly with steamed rice or bread. They have added Indian dishes, such as malai kofta, kadhai chicken and chicken Chettinad that will fill you up in no time. Make sure you leave some space in your tummy for their signature Nutella Cigar rolls that are all the rage with dessert lovers. It’s about time you catch up with your old friends for a chill session. Let this be your excuse to grab few cocktails and have a great time! Did we mention they have Ladies Night on Mondays with the live band TOYA playing, and drinks on the house post 7 pm. Also, on Thursdays they give out 20% discounts if you produce a corporate ID? Also, dance the night away on Saturday and Sunday at their Bollywood and Retro nights. For bookings, you can call them on 9650059925 or 9650066315. Check out more details and offers on their Facebook & Instagram pages. In Love With Indo-Arabic Cuisines? 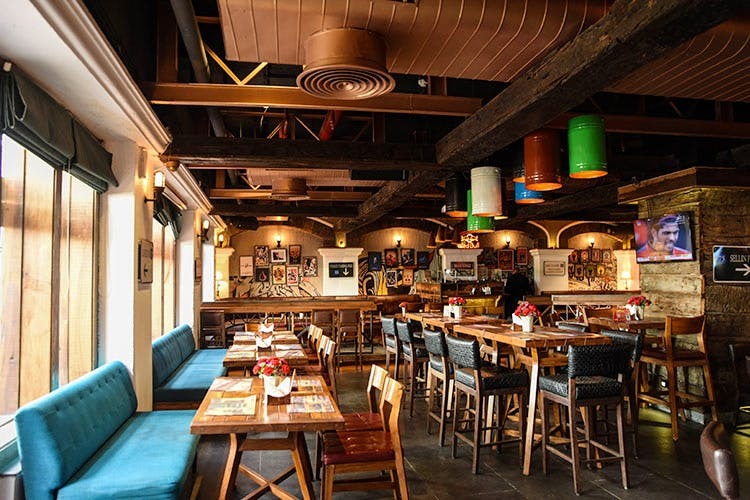 Then Visit This Rustic Bar in Cyber Hub ASAP!